February is the month of love, which means it’s a time for Valentines, roses, and love songs. Do you know that love songs are more than just sappy lyrics or heart-wrenching vocals? In fact, some of the most popular love songs today have a message that can apply to your job search or career as well. 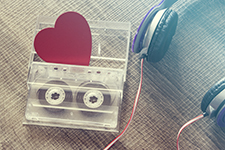 Here are five workplace lessons you can learn from popular love songs playing on the radio today! The lyrics say, “Oh don’t you dare look back. Just keep your eyes on me. I said you’re holding back. She said shut up and dance with me.” This song has many timely messages for the workplace. Like the lyrics suggest, don’t look back on past jobs, failures, or mistakes. Keep your eyes on the present and the ways you can succeed. When you look back, you lose track of your future, so ignore the voice that constantly reminds you of your past, and dance into making your career the best it can be. Stop procrastinating and holding back. Yeah, we’ve all been there. We remember “the good old days when our momma sang us to sleep,” but now “we’re stressed out.” This song helps us remember that stress can be detrimental to not only our health, but our work quality as well. If you find that you are overwhelmed at your job, find ways to deal with that stress, like getting regular sleep, exercising to burn off energy, or talking with a supervisor about ways to lighten your load. This song is a great reminder to be grateful for your job every day. With the confusing economy, lots of workers have been laid off and are desperate for a job. Never take for granted that your position is not invincible. Work at all times to make yourself valuable and irreplaceable so you won’t have to worry about losing your job. Guess what? Even rock stars make mistakes. In this song, Bieber says, “You gotta go and get angry at all of my honesty. You know I try but I don’t do too well with apologies. I hope I don’t run out of time, could someone call the referee? ‘Cause I just need one more shot at forgiveness.” If you make a mistake at work, own up to it. Honestly confessing that something went wrong and then finding a way to make it right works much better than covering up the mistake or blaming someone else. Sometimes, everyone needs one more shot. Likely, if you are honest and have a plan to correct your mistake, you’ll get that shot to redeem yourself. Do you have any love songs that motivate you at work too? Share your favorites in the comments section below! What an unique idea! I just loved the way you think. Keep sharing more.